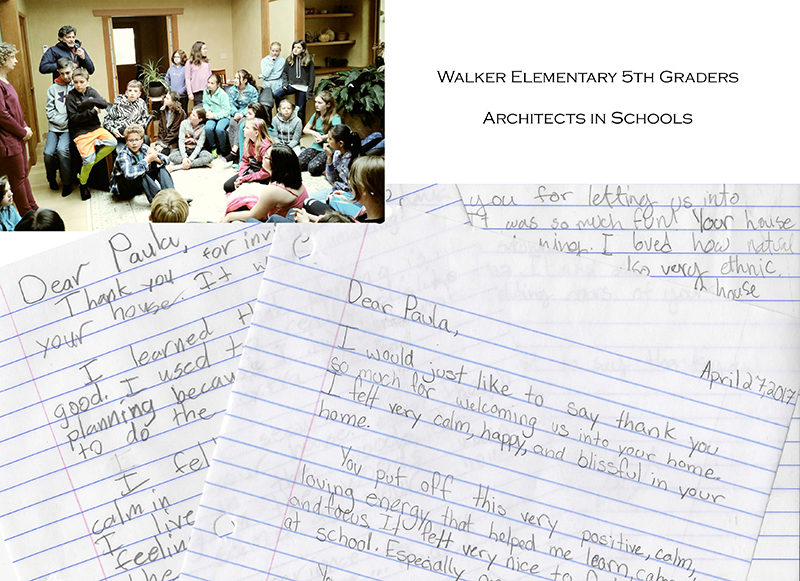 Last spring, Walker Elementary School's 5th graders visited EcoNest headquarters as a part of the Architects in Schools program. We filled the living room with these inquisitive students, talked about natural, healthy buildings, showed a video of how an EcoNest is built, and answered some great questions from some really smart, intuitive, and inventive kids! The thank you letters they sent were so much fun to read, also. It's nice to know that the future of architecture is in the hands of kids like these who know what's important! "I felt very calm, happy, and blissful in your home." "I can't wait to learn more about EcoNest houses. I now really want to be an EcoNest architect!" "I felt secure and calm in your house. My experience in your house was like . . . Magic." "I felt cozy and part of the environment in your home. It was an opportunity of a life time in architecture!" "I loved the smell of the forest that came through. I also loved the idyllic Japanese style." "Thank you for letting us into your home. I loved the idea of all natural building. My mom once got very sick from a building so I can personally relate." "I never knew that houses could be so peaceful. Or that you could mix clay and straw to make insulation. Your home is so pretty." "Your house feels so inviting and calm and such a happy place." "Thank you for letting us in your house. It was beautiful and I wish that I lived there. It was one of the best field trips ever." "I felt so comfortable there, as if I could fall asleep anywhere." "I wish we could have class here everyday."